What do you really pay? US Treasury & Mortgage rates in comparison with Inflation. 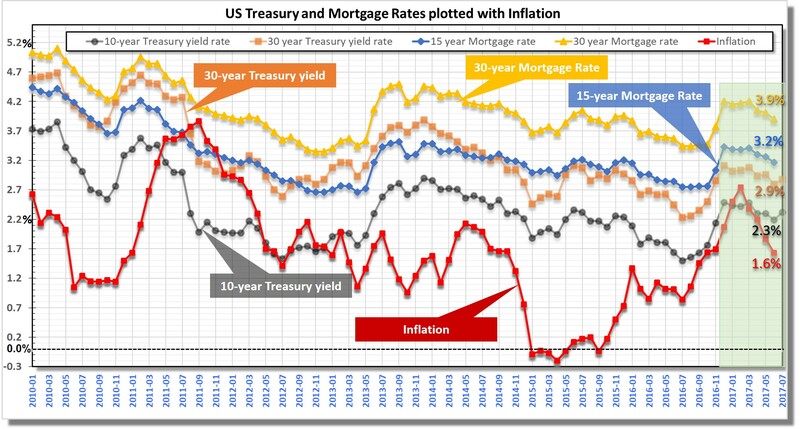 Inflation, the really big elephant in the room, plotted with US Treasury bond yield rates and Mortgage rates. Inflation, the rate as which prices increase, eats into any appreciation into our assets. So at 1.6% inflation (in June 2017), any money invested in 10 year treasury bonds are effectively only earning 0.7%. On the upside though, it makes the effective ‘interest’ one pays on 15-year mortgage to 1.6% (instead of 3.2%). Note the almost 0% inflation in 2015 when there were no price increases & the 3.7% inflation in 2011 when effectively the 15-year mortgage was cheaper than cash. If the inflation stays comparable to 10-year treasury (as in 2017) the return from these bonds is effectively zero. Therefore, pension funds and insurance companies, which are required to buy them in their portfolio, will have very low effective returns in future. Click on image to enlarge. Source: Freddie Mac & Federal Reserve & Inflationdata.com & the previous Chart of the day – Aug 9, 2017. Raw data for this chart are here.